Devoid Of Culture And Indifferent To The Arts: Dogs: Please, people, keep the sidewalk salt to a minimum! Dogs: Please, people, keep the sidewalk salt to a minimum! With the full onset of winter, the road salt is out in full force. Have you ever been walking your dog and they raise a paw (or paws)? They look at you so pitifully. "Why do I hurt?" It's because the salt they are walking through is burning their feet. This morning's sidewalk condiment, just up the road a few feet. This is nothing. Rock salt and most chemical de-icers irritate a dog's paws and turn a winter walk into a painful ordeal. It's dangerous on the walk, and again when they return home and try to lick it off. 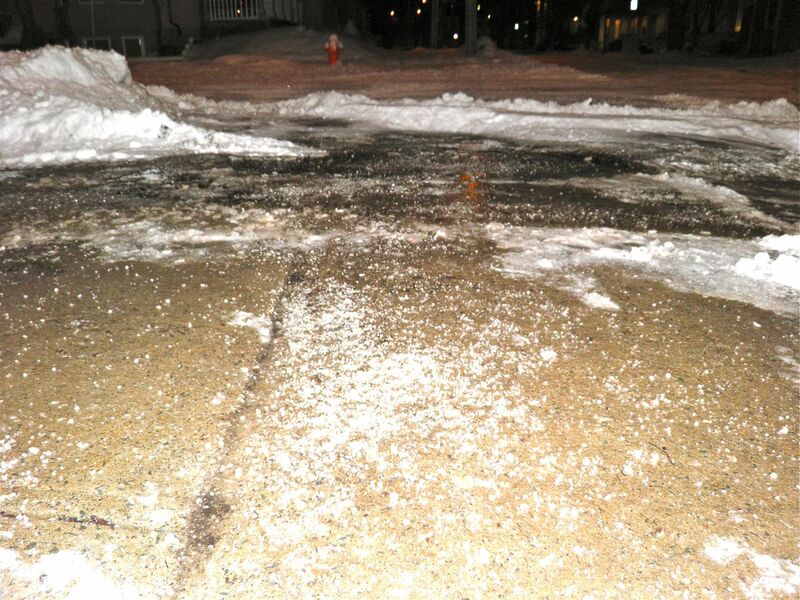 Road salt has chemicals added to increase its effectiveness. Ingesting it can be toxic. This morning on our walk I ran into this problem with Henry. We had a skiff of snow the previous night and snow removal companies were out in full force. In places the salt was actually over an inch thick. I would suggest this is neither environmentally, or financially, wise. When Simon was quite young, and I unaware of this problem, he actually collapsed on Spring Garden Road because his paws burned so terribly. I had to physically pick him up and carry him about 1/4 of a block. Simon was a Bouvier and weighed about 65 lbs at the time. It's amazing the strength you can muster when your child is in pain. "Calcium chloride is preferred over sodium chloride, as CaCl2 releases energy upon forming a solution with water, heating any ice or snow it is in contact with. It also lowers the freezing point, depending on the concentration. Whereas the minimum freezing point is −21.12 °C for 23.31 wt% of salt, the freezing near this concentration is so slow that the eutectic point of −22.4 °C can be reached with about 25 wt% of salt. (Do you understand any of that? I don't. - D) NaCl does not release heat upon solution; however, it does lower the freezing point. Calcium chloride is thought to be more environmentally friendly than sodium chloride when used to de-ice roads, however a drawback is that it tends to promote corrosion (of vehicles) more so than sodium chloride. NaCl is also more readily available and does not have any special handling or storage requirements, unlike calcium chloride." We can't very well change the policy for an entire city, but what can we do as individual home owners? The US National Animal Poison Control suggests using sand or cat litter for traction instead of salt. It won't melt snow or ice, but won't hurt your (or other pet owners) dog's feet. My mother uses only sand in consideration of her dog. What can we do to protect our pets? Wash their paws before going out and apply either Vaseline or Bag Balm (a farm product for cow's udders). When you return, repeat. As a preventative measure keep the hair trimmed on the bottom of your pet's feet. This will help stop the build-up of the salty slush that causes their pain. Of course, there's always boots, but some dogs (Simon was one) won't abide them. It is good for a laugh, though. Currently we're in the midst of a full-on snowstorm. I dread our walks the next few days. If you like this post, please feel free to retweet it with the link at the top right, or share it using any of the links directly below.